Fishing has been “much better than average” for the months of January and February so far this winter! The strong El Nino weather pattern means our sea surface temps are much higher than normal for this time of year. We’ve consistently seen temps in our fishing grounds in the 74-79 degree range, when in a “normal” winter we should bottom out around 70 degrees. Warmer water means more big predators hanging around, more baitfish, and better fishing! 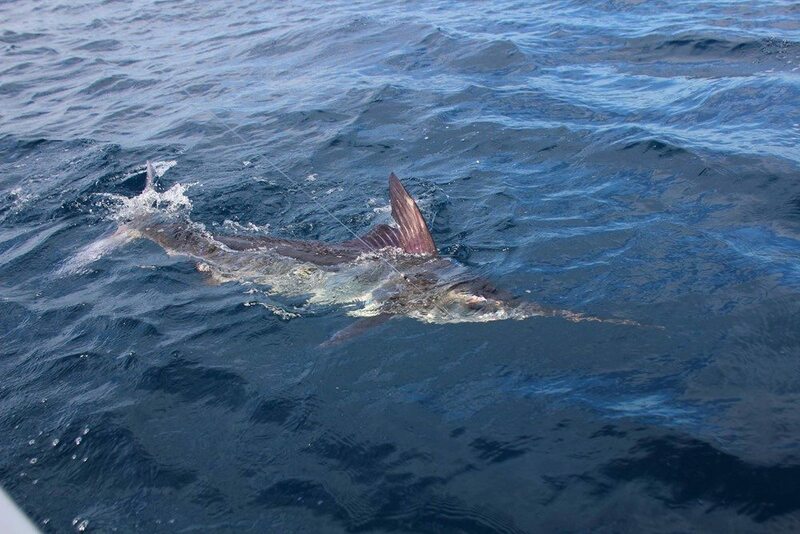 Striped marlin numbers are strong for this time of year. Multiple hookups are possible in a day’s fishing, with catch-and-release for all billfish strongly emphasized/encouraged. As we continue to progress toward spring, the marlin fishing only continues to improve, as these fish are drawn to the Sea of Cortez on their annual spawning run. We’re already seeing some of the big females in the 150-190# class, as well as many males in the 115-150# range. Dorado fishing has been very good. Numbers of fish are available, with some specimens pushing the 20-pound mark–very nice size for January and February! This is one of our prized species for processing, and guests are returning home with vacuum-packed fillets and savoring the taste of Baja long after their fishing vacation has concluded. Inshore, we’re also catching lots of delicious sierra mackerel and a few yellowtail. With sea surface temps in the 75-77 degree range right now, we are anticipating the early arrival of wahoo, roosterfish, and schoolie tuna to get our peak fishing season started off with a bang.